You'll enjoy delicious food in the restaurant, prepared using fresh ingredients from the lodge's organic farm and other local suppliers. The gardens are perfect for strolling, admiring the scented blooms and watching the many birds and butterflies, and down by the shore you may spot dolphins. The pool offers healthy exercise while sun-lovers can lie back and perfect their tans. Open: Playa Cativo is open all year. Location: Playa Cativo is on the east coast of the Golfo Dulce, the inland side of the Osa Peninsula, on the southern Pacific coast. 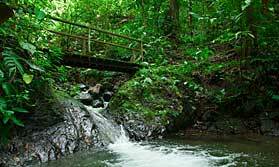 It's set in 1,000 acres of private rainforest bordering Piedras Blancas National Park. The nearest airports are Golfito and Puerto Jimenez, each under an hour's flight from San Jose, from where it's about a 25 minute boat ride to Playa Cativo. Rooms: There are 8 guest rooms in deluxe, luxury, premium and premium plus categories. All feature locally crafted wood and decorative work, have king-size beds, sofas, ceiling fans, safe and WiFi. En-suite bathrooms are modern with rain showers, a range of toiletries and your own cotton bathrobe. Luxury and premium rooms are larger and the latter have minibars and twin hand basins in the bathrooms. Premium plus rooms have 180 degree views and a private plunge pool. All rooms have ocean views and are open to admit the fresh air and the sounds of the rainforest and ocean, with solid mesh screens fitted each evening and curtains that can be pulled across. Activities: There are several walking trails in the grounds leading through rainforest, along the beach, inland past the lodge's organic farm and into the valley where you may see monkeys, deer, peccaries, agoutis and many birds. The lodge provides snorkelling gear, kayaks and paddle boards free to guests. Other options available for an extra charge (pay locally) include a guided tour of the lodge's farm, hand-line fishing from the pier, guided nature hikes in Piedras Blancas National Park, nocturnal nature walks, bird watching, guided walks to waterfalls for swimming, dolphin and whale watching (in season, May-October) boat trips, and guided tours of Golfito and Puerto Jimenez. Lodge staff can arrange visits to Osa Wildlife Sanctuary, Casa Orquideas Botanical Gardens and deep sea fishing trips. Facilities: El Gavilan Restaurant offers both modern and traditional Costa Rican dishes. The majority of the ingredients are organic and locally grown or sourced. There is a comprehensive selection of wines, beers and spirits. There's an outdoor swimming pool and sunbathing area, and beautiful flower-filled gardens which attract birds and butterflies. Indoors you can enjoy quiet time in the air conditioned library, browsing through books at your leisure. Staff can arrange spa treatments and yoga sessions, which need to be requested in advance. There are binoculars and telescopes for guests to use to spot birds and animals in the gardens, and dolphins and whales in the bay. The lodge offers a laundry service. Dining: Meals are eaten at separate tables. In-room dining can be arranged on request. Communication: There is WiFi in guest rooms and common areas. "Arriving at Playa Cativo, staff bring out a metal ramp painted red so itâ€™s a kind of wet red carpet welcome, and typical of the courteous treatment youâ€™ll receive here! The gardens are beautifully planted and attract a lot of birds. I was even able to photograph toucans from my room. Rooms have open sides during the day, bringing light and sounds inside, and staff come in the late afternoon to close it all up with screens, so youâ€™re cosy and secure after dark. Everything in the lodge is handmade; from the furniture to the painted pottery bowl basins in the bathroom. With world class accommodation and food, and plenty to do if you want to, or just relax, this place is a little piece of paradise. There are a few places in the world I fall in love with - and this is one of them!" "This was superb. The most stunning setting and hardly any people. We had a lovely room on the ground floor on the corner at the back so cool and birds and butterflies right there. Lovely swimming in the sea, at last a totally private paradise within a short walk! Lovely fresh water pool if that is to your taste.Really lovely guides who never seem to mind just two of you and took endless trouble to find interest. Service in the dining room a little slow and haphazard." "Stunning! Without doubt, the highlight of our trip. It is hard to put into words just how incredibly unique Playa Cativo is. Frederico met us at the airstrip and the adventure began. His passion is infectious! Approaching the Lodge by boat, you begin to realise that you are arriving somewhere very special. The location is stunning, the staff are exceptional but it is so much more than that. There is a vibe about the place. Everything has been thought of and everyone goes above and beyond to ensure that you have the most amazing and relaxing stay. Location - ocean meets rainforest. You wake to the sound of the waves and howler monkeys. Scarlet macaws fly above you, iguanas stroll around the garden. There is every kind of bird, insect, animal. You can even spot dolphins close to the shoreline. The Lodge - beautifully furnished rooms are all open air so the sights and sounds of the ocean and rainforest are always with you. There are no room keys - you don't need them. As Felipe said when he greeted us "Welcome to your home for the next few days". And that's the thing, you feel like you are home. Food - incredible! Fresh, varied, delicious. I don't think we have ever eaten so healthily on holiday. Activities - amazing! Whale and dolphin watching boat trip, rainforest trek to the Piedras Blancas reserve, boat and kayaking trip to the mangrove swamps, evening boat trip to see the bioluminescence. Staff - unbelievable! Passion, enthusiasm, kindness, smiles, laughter. Our guides Jose and Michael gave us two of the best experiences we have ever had - the whale watching and mangrove trips. Their warmth and their ability to spot wildlife made both trips adventures that we will never forget. " "We were upgraded to a room in the main building which was slightly noisy from the kitchen on the first night but it’s a fabulous place with great food and friendly staff. Again you get to it by boat. We saw lots of dolphins and the bird guide was great. Shame we didn’t do the kayaking but we relaxed by the pool instead. "